Wesleyan University Press, 9780819574275, 295pp. Contemporary visions of the future have been shaped by hopes and fears about the effects of human technology and global capitalism on the natural world. In an era of climate change, mass extinction, and oil shortage, such visions have become increasingly catastrophic, even apocalyptic. 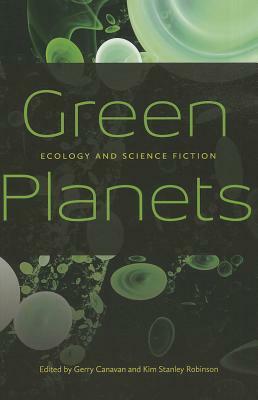 Exploring the close relationship between science fiction, ecology, and environmentalism, the essays in Green Planets consider how science fiction writers have been working through this crisis. Beginning with H. G. Wells and passing through major twentieth-century writers like Ursula K. Le Guin, Stanislaw Lem, and Thomas Disch to contemporary authors like Margaret Atwood, China Mi ville, and Paolo Bacigalupi--as well as recent blockbuster films like Avatar and District 9--the essays in Green Planets consider the important place for science fiction in a culture that now seems to have a very uncertain future. The book includes an extended interview with Kim Stanley Robinson and an annotated list for further exploration of "ecological SF" and related works of fiction, nonfiction, films, television, comics, children's cartoons, anime, video games, music, and more. Contributors include Christina Alt, Brent Bellamy, Sabine H hler, Adeline Johns-Putra, Melody Jue, Rob Latham, Andrew Milner, Timothy Morton, Eric C. Otto, Michael Page, Christopher Palmer, Gib Prettyman, Elzette Steenkamp, Imre Szeman.